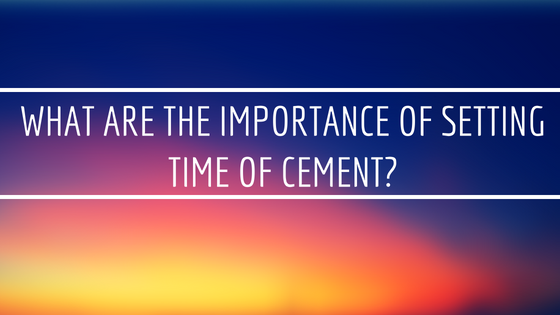 What is Initial setting time Of Cement? The Initial Setting Time Of Cement starts right from when water is added to cement to the point where it starts to lose its plasticity. What is The Final Setting time Of Cement? The final setting time of cement is the time at which the cement has totally lost its plasticity and hard enough to form the shape of the mold on which it has been cast. The final setting time of cement is the time it takes for the cement to become completely solidified after hydration has taken place. Why is Initial Setting Time Is Important On Site? Setting time should be such enough that cement an be easily mixed with other constituents (aggregate,sand,admixtures) easily. Concrete placed should be in liquid state enough to be compacted easily by vibrators leaving no void or honeycombing. Setting time should such enough that outer surface of structure can be given desired finishing. If initial setting time is increased then afterwards setting rate increases rapidly thus shrinkage in stricture is more which leads formation of cracks. 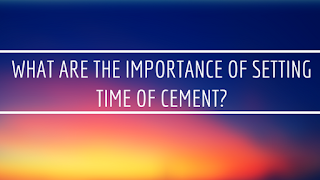 How Can setting Time Of Cement Be Manipulated?